Lu Over the Wall was huge last year where it picked up awards including at Annecy, where it took the “Cristal for a Feature Film”. It was directed by Masaaki Yuasa with a script written by Reiko Yoshida, a woman who has written many different anime such as A Silent Voice, Yowamushi Pedal, and Shirobako. It was produced by Yuasa’s protege (and a highly talented animator) Eun young Choi, and animated by Science SARU and these folks are the geniuses behind Mind Game, Ping Pong: The Animation, and The Tatami Galaxy amongst other great artistic titles. It has the look of the 2009 Ghibli film Ponyo if I were to make a glib comparison but the animation and style are pure Science SARU, a studio finally picking up fans in the mainstream. The film has been picked up for UK distribution by Anime Limited. Synopsis: Middle school student Kai finds himself forced to move from Tokyo to the declining fishing town of Hinashi to live with his father and grandfather following his parents’ divorce. For a kid from the big metropolis, there’s little for him to do besides composing music and sharing it on the Internet. One day his classmates Kunio and Yuuho invite him to join their band, and when he reluctantly accompanies them to practice on Mermaid Island, the three of them meet a mermaid named Lu. Through meeting her and playing music, Kai is slowly able to open up about his emotions but calamity soon strikes the town and he must find a way to avert it with his new-found friends and community! With a perfect combination of fantastic animation and a sublime story full of magical characters and great music, the film is perfect for the family. The day continues with screenings of Momotaro – Sacred Sailors, a rare chance for audiences in Wales to see how anime was used for propaganda in World War II. The evening arrives with a screening of the emotionally powerful drama, Fireworks, which takes us into an intense relationship between teenagers during a memorable summer. With characters voiced by the hottest talent in live-action Japanese cinema and with a script based on the work of Shunji Iwai, this will prove to be an emotional show-stopper. The day then ends with Vampire Hunter D: Bloodlust, a modern horror classic from Madhouse. We have three films directed by Hiromasa Yonebayashi, Mary and the Witch’s Flower and, two made at Studio Ghibli, When Marnie Was There and Arrietty programmed to help celebrate cultural and artistic ties between Britain and Japan in the year of British animation as part of Anim18, a celebration of British animation. When one thinks of Ghibli, strong female characters come to mind and Maquia: When the Promised Flower Blooms provides that with a tale of pure love in trying circumstances as an elfin teenage girl who doesn’t age takes care of a human boy who does. This fantasy tale comes from Mari Okada, a veteran writer who used her skills to direct what many consider one of the finest animated movies of 2018. The day then ends with a screening of the live-action adaptation of the super-popular manga Tokyo Ghoul in our traditional horror/mature slot. Sui Ishida’s dark-horror manga is brought to life with CG and features some top-class actors bringing the characters to life in a tale full of horror and action that is sure to sate the appetites of fans of the franchise. 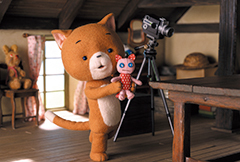 The final day of the Kotatsu festival in Cardiff on September 30 opens with When Marnie Was There and then Hirokazu Minegishi and Tsuneo Goda will be conducting stop-motion animation demonstrations and a workshop to show people how they animate their films. These events will be followed by Q&A sessions. The films continue with Psychic School Wars, a beautifully animated adaptation of a well-known Japanese sci-fi tale that is sure to delight a wide audience. Synopsis: It is spring and another new school year and another school for 8th grade junior high school student Ryoichi Kyogoku (Ono) who has recently moved to Kamakura. Things might be boring but Kyogoku is a telepath and has been ordered by his father to use this ability to scan other people’s minds and take over the school. Being good looking and charismatic, he wins major popularity at the school which allows him to initiate his plans. He secretly manipulates his followers and pushes aside anyone who gets in his way but there is one student who seems unaffected – Seki. Does Seki have what it takes to save everyone? The day closes with a screening of the immensely popular Attack on Titan: The Roar of Awakening, which takes audiences back into the thrilling and gruelling fight for humanity’s survival in a world full of man-eating giants. I used to be a huge fan of this show. I read the manga, a light novel or two, and watched the anime. Now, I barely watch anime at all… This is a compilation film consisting of episodes from the second season. Synopsis from My Anime List: Eren Yeager and others of the 104th Training Corps have just begun to become full members of the Survey Corps. As they ready themselves to face the Titans once again, their preparations are interrupted by the invasion of Wall Rose—but all is not as it seems as more mysteries are unravelled. As the Survey Corps races to save the wall, they uncover more about the invading Titans and the dark secrets of their own members. The festival launches in the beautiful coastal town of Aberystwyth at the Aberystwyth Arts Centre on Saturday, October 20 at 10:00, with a screening of the Studio Ghibli When Marnie Was There. This will be followed by the family film Lu Over the Wall at 12:30 before the cinematic delights finish with a 15:00 screening of Psychic School Wars. Sunday, October 21 opens with Mamoru Hosoda’s latest eagerly-anticipated title, Mirai, which is a magical tale of the time-travelling antics. Probably film of the week by a long-shot. The reviews from this year’s Cannes film festival paint this to be a home-run for Mamoru Hosoda. The film got its world premiere at the Cannes Film Festival and will be screened at the BFI London Film Festival and Kotatsu is proud to be bringing it to Wales when it screens in Aberystwyth at 13:45. The next film to follow is the emotionally powerful drama, Fireworks at 15:35, and the final day of Kotatsu 2018 closes with Attack on Titan: The Roar of Awakening.